Lexicillin: #PatientEngagement - "Attending: Medicine, Mindfulness, and Humanity"
Exploring the complexity and uncertainty of healthcare delivery, with an aim towards better patient engagement. 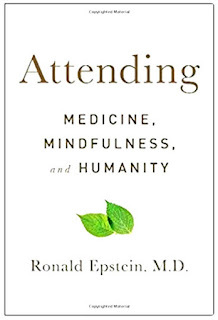 #PatientEngagement - "Attending: Medicine, Mindfulness, and Humanity"
The word "mindfulness" is rapidly becoming overused, but for understanding better patient engagement I heartily recommend Attending: Medicine, Mindfulness, and Humanity by Ronald Epstein, MD. Before I can do another post with a full review, I have to say it is a book both for patients and clinicians. I'm constantly saying (almost my mantra) that what patients need the most are empathy and information. Ron explains with examples from his own practice ways to accomplish this, even when both parties are frustrated by time, and sometimes emotion.